The buzz surrounding USB 3.0 is usually about its relationship with USB flash drives. USB flash drives provide users with blistering data transfer speeds. Flash drives engineered to accommodate the ever increasing sizes of music, video, and data files are at the disposal of users today. But what about other computer peripherals and accessories? So what if there’s a USB 3.0 mouse, keyboard, or speaker out there? What use would they have to the average user? 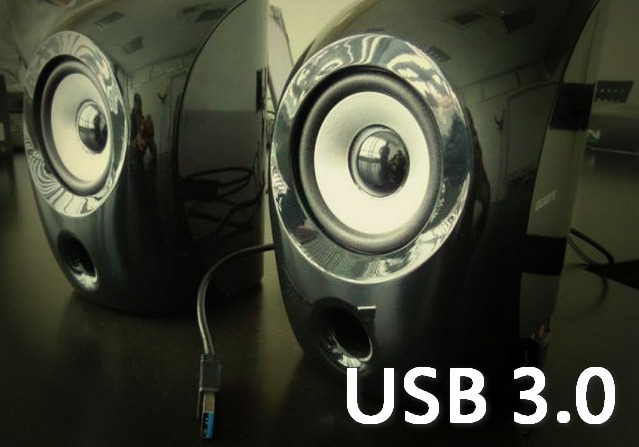 I’m not sure about the mouse and the keyboard, but there are a few reasons to invest in a pair of USB 3.0 speakers. The big reason to invest is power! With more power comes more amps. The Gigabyte GP-S3000 is a possible pioneer in the sound quality of USB speakers, not only do they not require an additional power source (because the power from your device powers the speakers), they will sound better and get louder than your USB 2.0 speakers! According to Gigabyte, the GP-S3000 is the first USB 3.0 speakers to ever be introduced into the world electronics industry. It seems to be an odd thing to brag about, but once you’re reminded by one crucial fact, Gigabyte’s boast starts to make some sense. That crucial fact is that USB 3.0 bus specifications not only deliver faster speeds, it also offers more power. USB 3.0 delivers 900mA, while USB 2.0 only musters 500mA for its maximum. For those interested in the numbers game, that’s an 80% increase in power output. The increase in power provides the GP-S3000 with the ability to power larger amplifiers who, in turn, are able to produce a bigger, clearer sound. The end result for the user is a more enjoyable listening experience. USB 3.0 specification isn’t the only thing going for the Gigabyte GP-S3000. The pair of speakers is designed with some high-end, audiophile-baiting features. There are built-in volume and music controls on one of the speakers, and integrated into the GP-S3000’s design is an integrated DAC. Not to mention, the speakers are housed in a stylish casing. You can choose between a white or black color schemes, depending on your taste, but both schemes look handsome enough to garner some cool points in the looks department. If you want to have a pair of Gigabyte’s speakers now, you, unfortunately, have to wait. The GP-S3000 currently has no scheduled date of release, and there’s no official price listing out. Gigabyte has even kept some of the speakers’ features under wraps until the official reveal. So, until these USB 3.0 speakers are released, you’re going to have to exercise patience and hold out hope for owning one of these trendy speakers. This entry was posted in Gigabyte, USB 3.0, USB Devices and tagged Gigabyte, GP-S3000, USB 3.0, USB peripherals, USB Speakers. Bookmark the permalink.